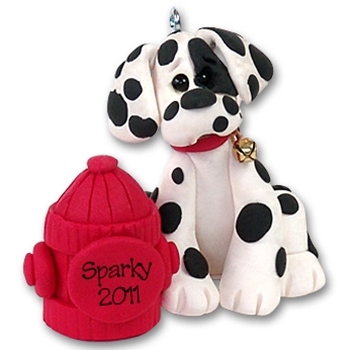 Sparky is a darling little Dalmatian and one of Deb's "Puppy Pal Collection". He is hard to resist with his big eyes and floppy ears! Sparky is special in that he has his own little fire hydrant. This puppy Christmas ornament may be easily personalized with a name on the fire hydrant. Designed and handmade from polymer clay by Debi Allison. He is packaged in his own little clear acrylic box with his dog house in the background. This is one of my original prototypes and there are only a few available.